The next generation of couples are starting the planning process armed with an arsenal of fresh inspiration courtesy of Pinterest, Instagram, and a genuine persistence to give their nearest and dearest an experience they’ll never forget. See ya later, steak vs chicken, dollar dances, and garter tosses. Hello burger bars, tiered doughnut cakes, and social media worthy photo walls. The staff at CRAVE catering couldn’t be happier to usher in this era of open minded couples. We’re all about thinking outside the box (or dinner plate), and putting on a show that will leave your guests talking. 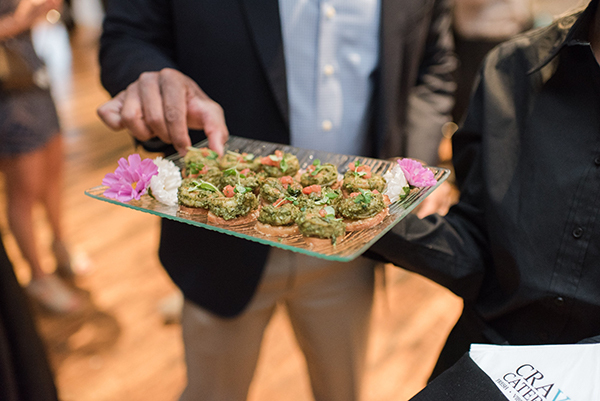 In addition to giving MUSE Event Center a glamorous makeover, we’ve also updated our menu with a refreshed twist on timeless wedding dishes (don’t worry — we’ll always have our signature sushi). 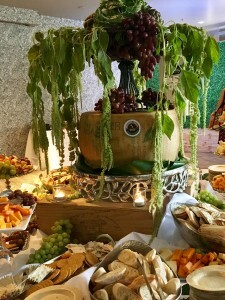 CRAVE thrives on our ability to customize your event to make it uniquely you. Whether you’re looking to serve a family-style Italian dinner for 300 guests, or host an intimate brunch for 50 of your friends and family members, our staff will work one-on-one with you to make sure it’s everything you dreamed of and more. There’s one reason we’re in this industry, to see the look on your face when you see your vision come to life. If your wedding leaves you speechless and the planning stress-free, that means we did our job. This month we’re talking to some of the best local industry experts for their input on hosting a wedding to remember. Courtesy of bartender Aaron Palm. This drink is a new twist on an old classic. It brings out the best of both worlds, thanks to a combination of prosecco, vapor infused local gin, a mint simple syrup, and finger lime garnish. There are two variations for this simple, delightful drink. For a spring or summer cocktail, use 3 ounces of prosecco (host’s choice, however we like the clean nature of Lamarca), 1/2 ounce of gin from Minneapolis-based Norseman Distillery, 1/2 ounce of mint simple syrup, and garnish with finger lime “caviar” (the fruit within the finger lime). For a fall or winter variation, create a deep, rich hue by adding 1/2 cup of fresh blackberries to the mint simple syrup. To make the mint simple syrup, mix 1 cup water, 1 cup granulated sugar, and 1 cup fresh mint leaves in a pot over heat. Bring the mixture to a boil. Let simmer for 30 seconds and up to a full minute. Remove from heat, and steep for an hour. Strain the liquid into a separate container, store, and keep chilled until use. Samantha has been working with wedding clients at CRAVE for two years. Prior to that, she worked in sports catering (think PGA tours), an arena that demanded thinking on your feet when it came to execution. “When I first came to CRAVE I had never touched a wedding and was scared they might be awful. But I ended up loving it. It’s the most rewarding work I’ve done. Nobody gives you a heartfelt hug at the end of a major golf event,” she says. Q: What is the best way to start the wedding planning process? A: Choosing a venue is the first step. Before couples begin that search, though, they need to know their guest count and budget. Remember that you can always grow into a venue, so having extra room is not an issue. I recommend not looking at any venues you know are outside of your budget. Being creative does not equate to cost. I also recommend that you know your style. Do you want indoor or outdoor? Sunlight or dark and romantic? What will the energy of your wedding be, and does that venue offer that? Q: Tell us about some of your favorite local venues. A: This last year was all about the Machine Shop in Northeast Minneapolis. It’s an open concept, beautiful yet industrial. It has this light, breezy feel. ARIA is one of my favorites, too, because it can be so dark and romantic. The light is glowing, and everyone looks gorgeous. I also like 514 Studios in Minneapolis. It’s a smaller venue for the more laid back bride. You can get very creative in that space. I’m waiting to do a big wedding at Union Depot, and I can’t wait for Hutton House to open. It reminds me of the Hamptons, everything is white and gorgeous and the amenities are incredible. 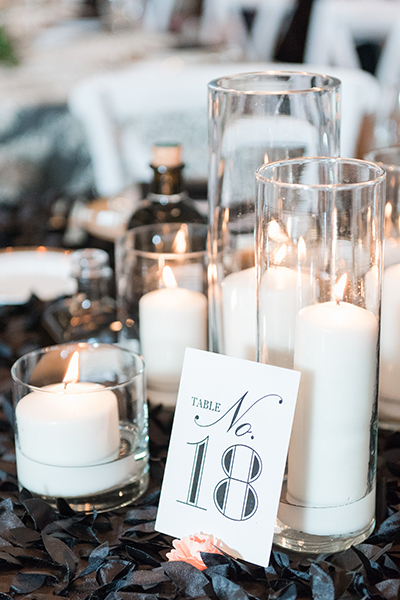 We just made over MUSE and took it from a concert venue to full-on glam wedding. So it doesn’t’ need a lot of decor to look beautiful. PIKA is a cool space we love, too. It’s a smaller venue that usually attracts very creative brides. Q: What would surprise clients the most about working with you? A: I am not a “yes” person. I have a tough love approach. But brides and grooms appreciate my honesty, and at the end of the day they thank me because of it. I will listen to your ideas and tell you how we can make them work and maintain a good flow. A: Dessert tastings. (I’m joking.) Hands down, it is watching a bride see her room flipped. I literally pull them away to show them the space before everyone else, so they can soak in all of the time they spent planning. I love getting to watch them have a minute to take it all in. 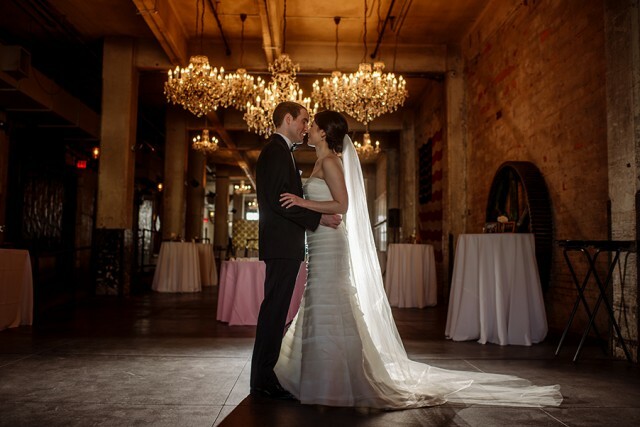 Heidi and John LaSalle were married on May 20th, 2017 at the Machine Shop in Northeast Minneapolis. It’s always an honor to throw a wedding for any of our clients. But it’s different when that client is one of our own. Heidi has worked on the CRAVE catering sales team for four years. When she and John were married, our team pulled out all the stops (and threw in a few surprises) to make sure it was an event to remember. We asked Heidi to share the most memorable moments from their big day. Our friends had been trying to get us together since we met ten years ago, on St. Patrick’s Day. It took awhile for it to happen, and two years ago — at my best friend’s birthday party — John walked up to my girlfriends and told them he was going to marry me. I thought it was adorable. We went on a date the next day. When it came to planning the wedding, we had strong opinions about certain decisions like the venue and the music. But I didn’t have a strong opinion about the food, because I work with it every single day. So I waited awhile to walk through the menu. When I met with John Chestnut, our chef, he asked if he could just surprise us. So I had no idea what our menu was until they started bringing out the food on our wedding day! I didn’t even know if it would be plated or not. My family is Italian, and we served a family style meal: caesar salad, tuscan short ribs, herbed chicken, polenta, roasted veggies. (There was one thing I had to have, and that was balsamic, olive oil, parmesan, and a baguette on every table.) Farina Baking Company made a beautiful two-tiered black cake with gold trim, and a spread of mini desserts. There were macaroons, tiramisu, and dessert shooters modeled after an Old Fashioned (John’s favorite cocktail). My favorite part of the day was after I saw the room flipped from our ceremony to the reception. At that point I started to see the surprises from our staff. There were mini golf stations, balloons everywhere, and the cocktail hour had a tiered “cake” made from wheels of cheese. And here’s a detail only someone in the industry would notice — they also surprised me with gold cutlery! Sarah McKee has been at ARIA for six months, and came with a hotel hospitality background. She was thrilled at an opportunity to work with couples in the historic building. “It’s rewarding for me to help people look their best, and give their guests that sparkle in their eye,” she says. 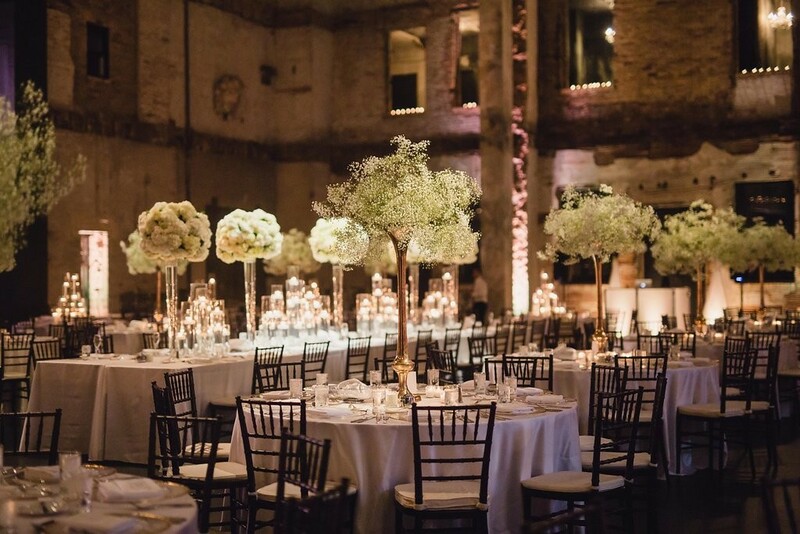 She’s sharing her tips for hosting a wedding in their iconic space. Make it a production. Many people don’t know that ARIA transitioned from a theater to an event space. So the acoustics are incredible, we have very flexible floor plans, and there are rigging points everywhere (meaning, you can literally hang installations anywhere you want). Know your limits. Weddings are shockingly expensive. A good way to think about budget is to consider how much you would spend to take someone out for a night on the town: buying a new outfit, getting flowers, maybe a steak dinner, dancing, drinks. Now multiply that by your guest count. But don’t be afraid to put on a show. We can fit 400 guests in ARIA. 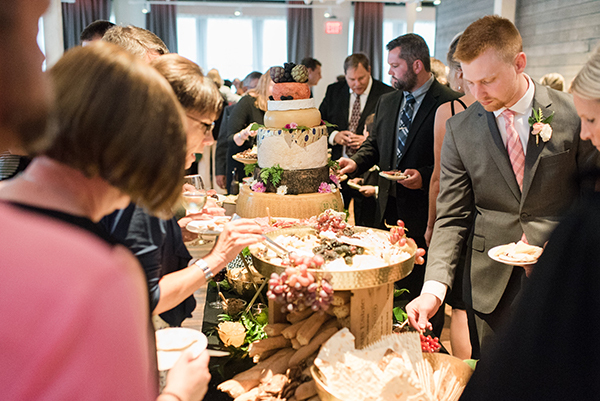 The average guest count is 200, but we’ve done weddings with 75 people, too. It’s impossible to overdo anything in this space. The room can take on a lot of drama. 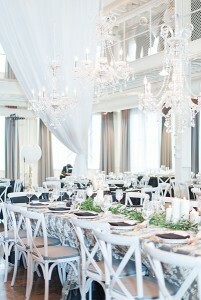 We’ve had couples go nuts with lots of hanging lanterns, chandeliers, and floral installations. We’ve even had two-story tall trees. And then there’s the infamous bride who had gone to circus school and floated into her ceremony on a hoop ring. There’s a new venue in town that has industry experts buzzing. The 12,500 square foot Hutton House in Medicine Lake will open its doors this November. 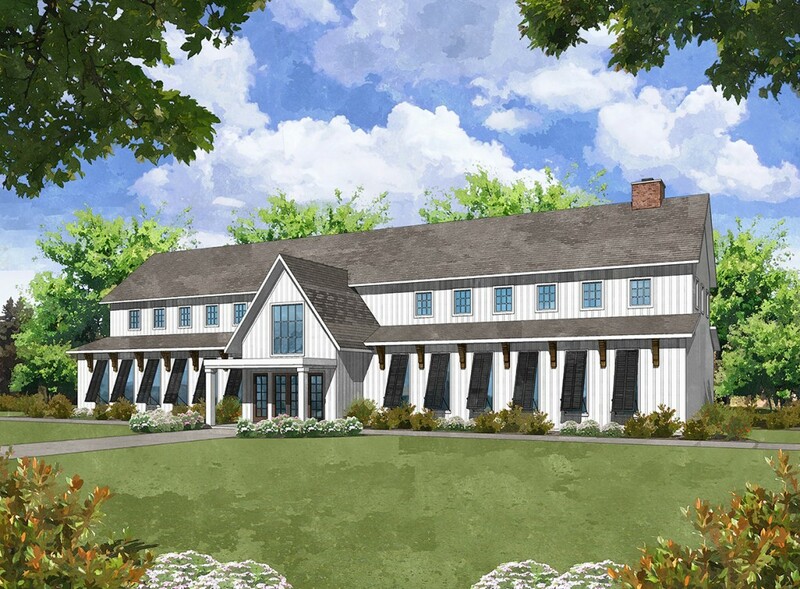 Aptly described as a freestanding modern farmhouse, it features two unique event rooms, the Lakeside Room and the Fireside Room, that enclose an outdoor courtyard. Hutton House boasts onsite parking with 140 spaces, and timeless (and smart) design details that will make event planners swoon (think a high-tech groom suite and an option to utilize preexisting tenting in the courtyard). We toured the site to preview the highly anticipated space. It’s all in the details. Nothing was overlooked, from the classic black and white color palate, to the mix of curated light fixtures and black bahama shutters that line the rows of tall, sleek windows. The fenced-in courtyard will pop against the bright white exterior, thanks to a vibrant green outdoor turf (no muddy footprints here). There’s a separate entrance for caterers, a stunning main room bar with an 8-foot long wine trough, and a one way mirror adjacent to the second floor bridal suite that allows the wedding party to peek down at their mingling guests (without letting them get a sneak peek of the dress). What’s in a name. The owners knew they wanted an alliteration in the name. Something couples would be proud to include on a formal wedding invitation, yet classic and clean enough for corporate events, too. When the name of one of the investor’s daughters came up during a conversation — Hutton — the team knew they had landed on something that was special enough to suit the space. Our expert team is always on the hunt for the next big trend because we want you to look your best on the day of your event. That’s why we keep a running tab of the most innovative food, design, and floral on both coasts and everywhere in between. Why do we love it? Giving your guests something to do will also give them something to talk about. We love a fresh twist on an old classic. Think s’mores stations, customized fries, or a grilled cheese bar.